Before we delve too deeply into Square Root Functions, I'm going to talk a little about Square Roots. And yes, we did cover this in Exponents but, it's important enough that we can cover it again (in a little more detail). When you take the root of a number or term, you are asking the question - "What times itself is this number - or term." So a root function is function whose expression contains a variable under a root sign. This webpage will be using this symbol √ as a root sign. So √16 would be ±4 because (+4)(+4) = 16 and (-4)(-4) = 16. The default for every root is 2. So, unless there's another number in the crook of the root symbol like ∛ you can safely assume you're dealing with a root of 2. 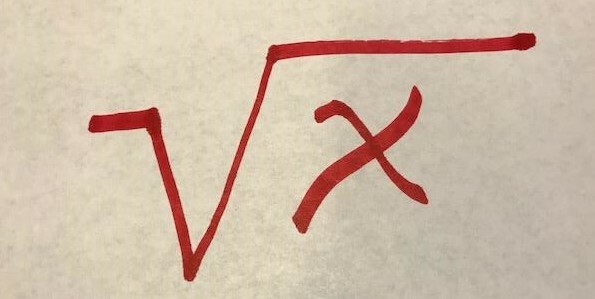 If we were working with a cubed root like ∛ then the number under the radical sign could be either positive or negative. ∛ -8 would have an answer of -2 because (-2)(-2)(-2) = -8 and ∛-8 is asking the question, what times itself three times is -8. Hopefully, we're talking about roots with the same base. Like √2 times √4. Because, if we are then it's easy. The answer is just √8. If you're trying to solve √2 times ∛4 then we have a problem. And we'll get to that later. When we are dealing with a regular √ root sign, we should always end up with a positive number under the radical. Because no number times itself is negative. But, of course, they still pop up. We still end up in situations where we need to find the answer to √-4 or something like it. Because we do end up with them at times, in real problems, we had to come up with a way to deal with them. First of all, we call these imaginary numbers. Because they shouldn't exist. We had to invent something, and came up with i. I won't swear to it, but I believe the i stands for imaginary. i = √-1. So, if you have a problem like √-4 you can change it to (√4)(√i ) which works out to ∓ 2i. It''s important to note that one could also express a square root as a fractional exponent. Please recall that (x2)(x2) = x(2+2) or x4. Similarly (x1/2)*(x1/2) = x(1/2+1/2) = x. (√x)(√x) = x. From this you could rightly conclude that x1/2 = √x. Likewise, ∛x is the same as x1/3.